Truvale is a Golf Society made up of members from Truagh and Emyvale and they organise outings for its members and arrange competitions on various Golf Course for the enjoyment of members. Each year they run a particular competition called the Charity Cup and it is played over two rounds on the Aughnacloy Golf Course and Rossmore in Monaghan. Any funds raised from this competition they present to local charities. This year two charities benefited and they are Crocus and The Autism Centre at Ballyoisin. Both these charities assist people and many gain immensely from both. Crocus now has its Centre just off Rowantree Road in Monaghan and is open daily Monday to Friday and it provides services and supports to cancer sufferers and their families. It is open to men and ladies and there is no charge for the services available and for the various activities organised to bring solace and healing to cancer patients and their families. It depends on voluntary contributions and is a very important and beneficial organisation in our area. The Autism Centre at Ballyoisin is part of and also independent of the Special Needs unit and again it is an essential facility as there are so many families who can benefit from it when it is up and running fully. Well done to Truvale for their generosity and assistance to to two very worthy causes. 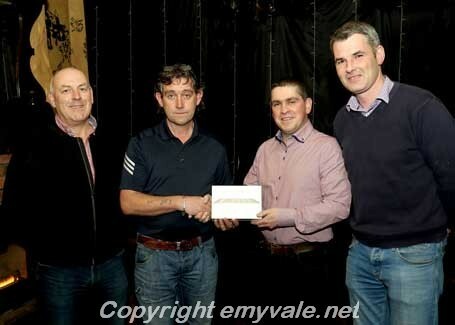 Bob Treanor, Martin McKenna and Stephen McCarron from Truvale present an iPad to Cathal Sherlock for the Autism Centre. 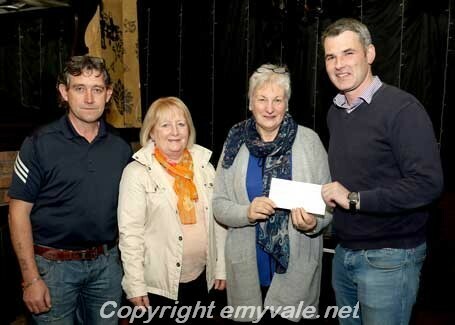 Bob Treanor and Stephen McCarron make a presentation of funding to Mary Callery and Mary O'Neill representing Crocus.